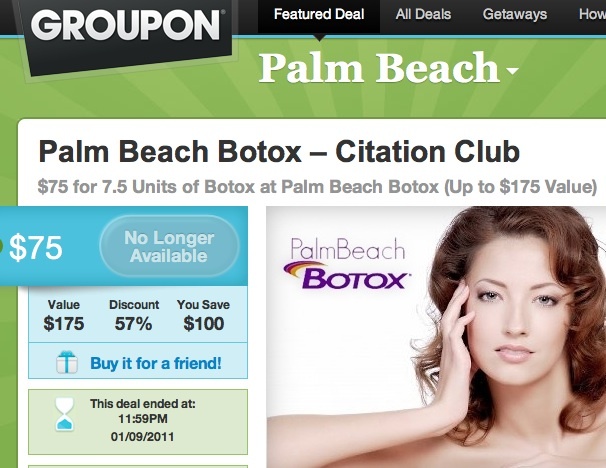 Groupon Daily Deals for Botox – Violation of State Regulations? Nearly everyone has heard of Groupon, the coupon site for daily deals. If you are on the receiving end as a consumer, it can be a great way to get some great deals. For over a year we have been seeing other plastic surgeons and dermatologists sell Botox® at huge discounts. Not wanting to be outdone by our competitors, we decided to explore our options for selling facial injectables such as Botox, Restylane, Juvederm and Sculptra via Groupon. If you are scratching your head, you may not be aware that many states have anti-kickback and ‘fee splitting’ rules for doctors. These rules forbid medical doctors from giving a payment to anyone for a referral. In other words, awarding a commission to an advertiser based on the income generated or number of patients treated is illegal. We first broached the question to one of our patients, who happens to be a well respected attorney here in Maryland. His short answer was that Groupon likely violates Maryland State laws on fee splitting. Having gotten his response, we next put in a phone call to the American Society of Plastic Surgeons (the ASPS) to hear their formal position on Groupon. They pointed the way to a recent article about the use of Groupon for cosmetic services published in the June 2011 issue of Plastic Surgery News, the trade publication for plastic surgeons. In summary, the ASPS article was written by the plastic surgeon who heads the ASPS Ethics Committee and a lawyer. They concluded that Groupon likely violates the laws for physicians in many states. In particular, they considered the use of Groupon to be in violation of laws in California, Florida, Illinois, and New York State. Lots of specific details were given about the regulations in these particular states. The State of Maryland was not discussed, but we are certain that the laws here are very similar, which means that kickbacks can not be given for referrals of patients. 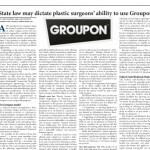 According to the ASPS, the use of Groupon to promote cosmetic surgery procedures likely to be illegal in many states. Haven’t done an assessment yet? Don’t consider it their obligation to determine legality? Has Groupon taken a new position since the writing of this article? Certainly an acknowledgement that including cosmetic services such as Botox injections within their daily deal offerings is illegal in many states would rain on the Groupon IPO parade. Halloween may be over, but for Groupon investors, this is a scary thing! The person in my office who deals with these matters is Leeza. Note: I’m a well respected expert with 12 years industry related experience. Interesting Article! I know several colleagues who have been approached by Groupon to offer “deals” such as these. In this economy it can be tempting to offer these types of promotions/coupons however, I think the always fun and effective “Botox event” or promotions such as that is more ethical than selling “coupons” for Botox. If injected incorrectly the repercussions can be less than ideal. Go to your State “Board of Physicians’ website. In any state there should be a tab for ‘Laws and Regulations’. Also, if there is a search box, input botox or injectables. Also look for your state’s definition of ‘medical procedure’. Some states define injectables as ‘medical procedures’ and others do not. There are stricter regulations for injectables if they are classified as medical procedures. Good luck–Let us know what you find out for your state! I have a question regarding the state regulations for cosmetic injection certification; specifically, certification of an RN to administer Botox, Juvederm, etc. Some states require a doctor to be present at the facility, while other states simply require a physician to be in the same state. Do you know where I can find concrete information on this matter? Our son works at Google so we were also familiar with a new Google product, “Google offers”, but we opted not use it because of these issues. So yes, we liked the idea, but now we understand the unethical aspects better. Commoditization is also a danger, and the problem is not so much the decrease in price but the legislative backlash should a patient be harmed by an unscrupulous practitioner. We’ would definitely concur on the reservations of using groupon as you listed. Thanks for highlighting. However, did you feel it was decent marketing vehicle? We’ve thought about it, but because of similar concerns and also the commoditizing of our services, we opted not to. Nevertheless, we appreciate you writing about it with such candor. Cheers. Of course the idea of a service like Groupon is appealing to get new clients in the door, but we must make sure we are abiding by state laws first. Make sure you are in the clear before you agree to let your practice be a part of a similar deal.